Chicago, USAKenya's Moses Mosop broke the men's course record by four seconds in 2:05:38 and Russia's Liliya Shobukhova set a personal best by nearly two minutes in the fastest time by a woman this year, 2:18:20, to triumph in the 34th Bank of America Chicago Marathon, an IAAF Gold Label Road Race, on Sunday (9). 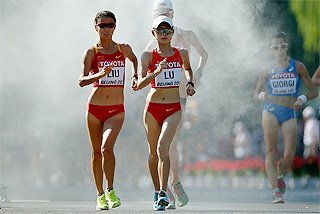 Running in war and sunny conditions - 64 degrees F at the start, near 70F at the finish for the leaders - "The Big Engine," as the other Kenyan runners have nicknamed Mosop, finished a dominating year and Shobukhova laid claim to the designation as a favourite for the women's Marathon title in next summer's London Olympics. Both dominated their respective genders, decimating the competition to the point where the only question in the later stages of the race was how fast their finish times would be. 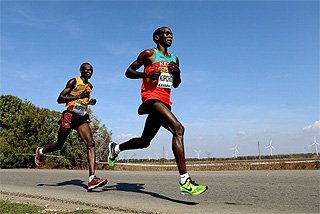 The men's pacemakers ran a relatively uneven pace for the first 15 kilometres of the race, playing catch up after each slow mile, noted American Ryan Hall, who despite running his third best time of the nine marathons he's run, was only able to finish fifth in 2:08:04. 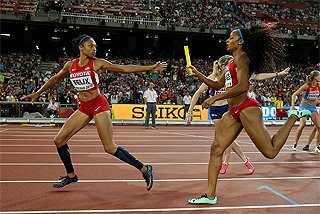 "Our splits were pretty much all over the place," said Hall. "(The pace makers) would see the (slow) split and they'd hit it. You can't expect it to be totally perfect like a metronome." 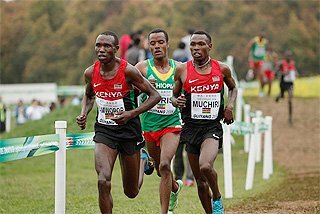 Mosop's coach, Renato Canova, said that the erratic early pace and two significant surges during the race by runner-up Wesley Korir (2:06:15) may have contributed to Mosop's slow final 5-K. "He was running slower than Shobukhova," said Canova. Mosop said he slowed because he missed getting fluids at the aid stations several times during the race, during the first 5-K and later at 40-K. Canova and Mosop both agreed that Mosop's training build up prior to the race was sub par, judging that Moses was 80-85% of his potential going into the race. "He paid," said Canova of his athlete's weak last 5-K, "because he's not prepared." After running a 30,000m World Record on the track in Eugene in June, Mosop didn't run at all in July because of an injury to his Achilles tendon, and in August was only able to run slowly "like an amateur," said Canova, because an unusual amount of rain made the muddy, red clay roads in Kenya too slippery. It was only by the sixth of September that Mosop was able to return to training full speed, his coach said. 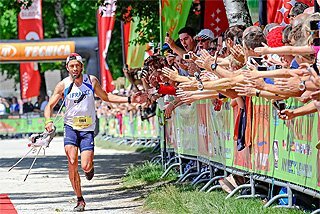 "We need two months (of solid training) before a marathon to prepare (adequately)," said Canova. "There are no secrets (to training). 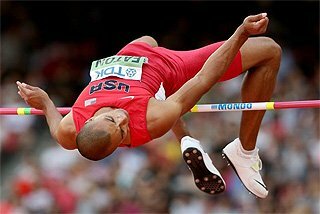 You need to use 80% of training to support the 20% of specific training (needed to perform to your potential)," he added. Essentially, Mosop had only had the "general" training or 80% of that formula and no specific training going into the race, Canova said. Though Mosop had concerns because he still had tenderness in the tendon going into the race, he only had a few twinges during the race and was not slowed by the healed injury. He was able to withstand the surges Korir threw at him, the last coming around the 30-K mark when Korir broke the pack of five leaders apart. "I had to break up the group," said Korir. "I don't have that good of a kick. Before the race I talked to my coach (Ron Mann) and he said maybe 18 or 19 miles to put a move in. I knew Moses was going to come back. 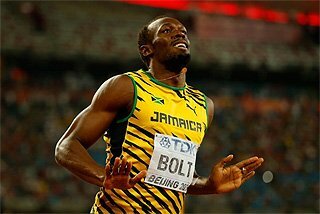 My goal was to break it up and work for a position on the podium." Mosop did indeed come back and ran the fastest 5-K split of the race during between 30 and 35 kilometres(14:29) to open a 26 second lead over Korir and 42 seconds over third place finisher, Kenyan Bernard Kipyego (2:06:29). "If this is 80%," said NBC television commentator Toni Reavis while watching Mosop crush the field, "I'm frightened." Mosop will collect $190,000 - $100,000 for the win, $50,000 for a course record, and $40,000 for a sub-2:06. After running the second fastest time ever for a Marathon in his debut in Boston (2:03:06) and the 30,000m World Record on the track, Mosop has had one of the fastest and most successful years ever. His two Marathon times combined are the fastest ever run in a single year. 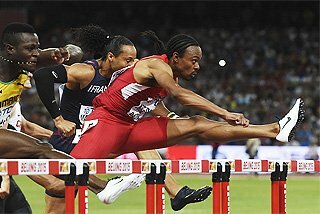 When asked what he thought he could have run if he had been fully prepared for Chicago, both he and his coach said that 2:02 was within Mosop's capabilities. Kenyans swept the top three spots at Chicago for the sixth time. There was no such flux in the woman's race as Shobukhova methodically pursued her pre-race goal of a sub 2:20 marathon, deviating from her past habit of running conservatively through the half, then attempting to run a negative split over the final 13.1 miles. 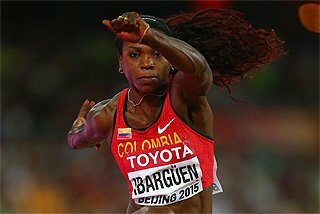 "My coach (who is also her husband, Igor Shobukhov) said to run sub-2:20 you have to change your tactics. 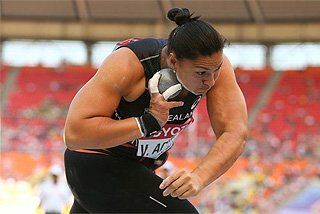 We decided to go out fast right away," Shobukhova said. Aiming for a first half of 1:09:30, she ran 1:09:25, and still was able to finish faster with the second half only taking 1:08:55. Women's runner-up Ejegayehu Dibaba of Ethiopia (2:22:09), who was running her first road race ever, was only able to hang with Shobukova through almost 25-K, but her time was still the third fastest ever for a women's debut Marathon. 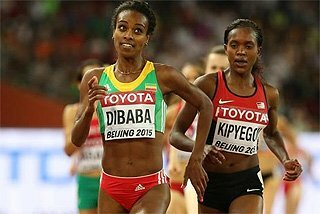 A calf injury a week before the race concerned Dibaba, but didn't impact her race. 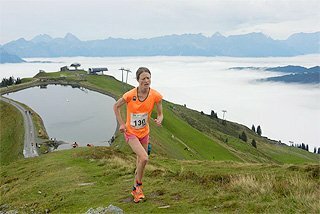 Shobukhova, who trained at altitude for the first time prior to Chicago (she had done it twice before the Virgin London Marathon, but never in the Fall), the build up was perfect, aimed at running 2:19. Instead she surprised even herself by breaking her own personal record by nearly two minutes, the Russian women's record for the Marathon, and the second fastest time ever by a woman in Chicago. The time makes her pretty much a lock for a spot on the Russian Olympic team, her primary goal going into the race. For the win Shobokhuva won $140,000 -$100,000 for the win and $40,000 for a sub-2:20. Her time is the fourth fastest of all time, with only Paula Radcliffe's three races times from 2:15:25 to 2:17:42 in front of her. Shobukhova is the third woman to run under 2:20 this year and the 12th ever to do it. A record total of 37,400 runners started the event and the second highest number of finishers were expected, said executive race director Cary Pinkowski at an afternoon press conference before all the runners had completed the course. One runner died during the event, collapsing within 500 yards of the finish, according to race medical director Dr. George Chiampas.